My little congregation in having a musical Sabbath tonight. To be precise, the klezmer band “The Kosher Red Hots” will play. Klezmer is a musical tradition of the Ashkenazic Jews of Eastern Europe. Klezmer music is easily identifiable by its expressive melodies, reminiscent of the human voice, complete with laughing and weeping. Two of the members of the band are members of the congregation. We expect a crowd of guests to come to hear them. Like every Friday night service, there will be an oneg – enjoying Shabbat by eating snacks and sweets after the service. This is not a potluck meal, but “a little something” to have while you socialize with others. But this time we expect a larger number of people, so the word went out “bring extra”, if we run out of food, it will be a shanda (a shame on us). So I decided on cookies, since most recipes make a lot of cookies. These thumbprint cookies, from American Profile, are very easy to make, and can be made the day before. In fact, they are the type of cookie that can be packed and sent as a gift – they’re pretty sturdy despite their delicate texture. You can use any jam you have in the house. I used blackberry jam for half of them, and ginger jam for the other half. But apricot, strawberry, or even exotic jams will work. Sift together flour and salt; set aside. Cream butter and sugar until light and fluffy; add extract(s). Slowly mix in flour, 1/2 cup at a time, until just blended. If you find the dough is too crumbly and not coming together, just beat it a little longer (with an electric hand or stand mixer) and you will get a creamy, light smooth texture. Wrap the dough in wax paper or plastic wrap and chill in refrigerator for 1 to 2 hours. Preheat oven to 325°F. Quickly shape dough into 1-inch balls, and space them 2 inches apart on ungreased baking sheets. Make a deep thumbprint in the center of each dough ball; fill with preferred jam. Bake for 15-20 minutes, or until cookies are the color of pale sand. Transfer to wire cooling racks. When cooled, dust with confectioners’ sugar. Makes 48 buttery cookies at 4 grams of fat/cookie. There was still zucchini left even after making zucchini bread. That thing was huge! It has gotten decidedly chilly, and time to bake things to warm the kitchen up. My television and comfy chairs are in the little family room that is part of the kitchen, so using the oven makes for a pleasant space to relax. I started to look up Zucchini Cookies. I didn’t want anything fancy. These weren’t take to a potluck cookies (although a plateful came to the office). I wanted cookies that were low enough in fat to tuck in my lunch bag or eat for a late night (ok, early morning, too.) snack. 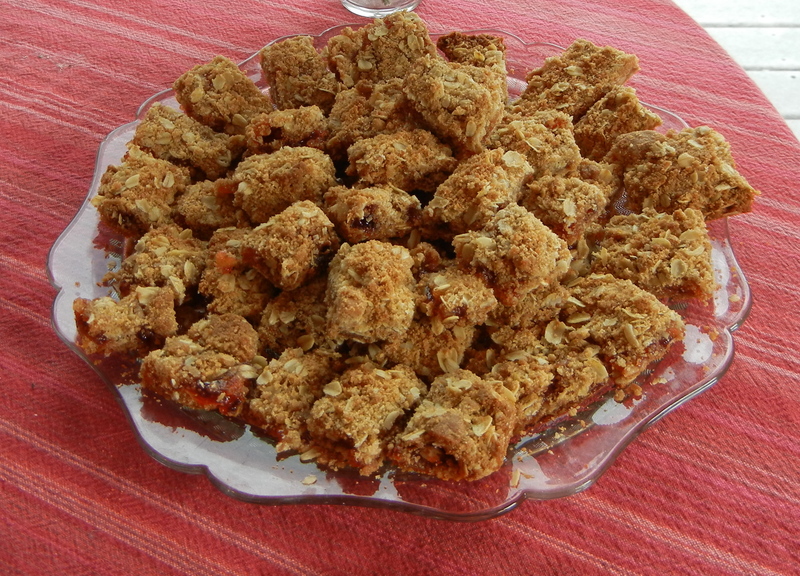 Many of the recipes had nuts and/or chocolate chips – and even coconut. You could add one of these to dress up the cookies, but you’d have to add them to your fat count. 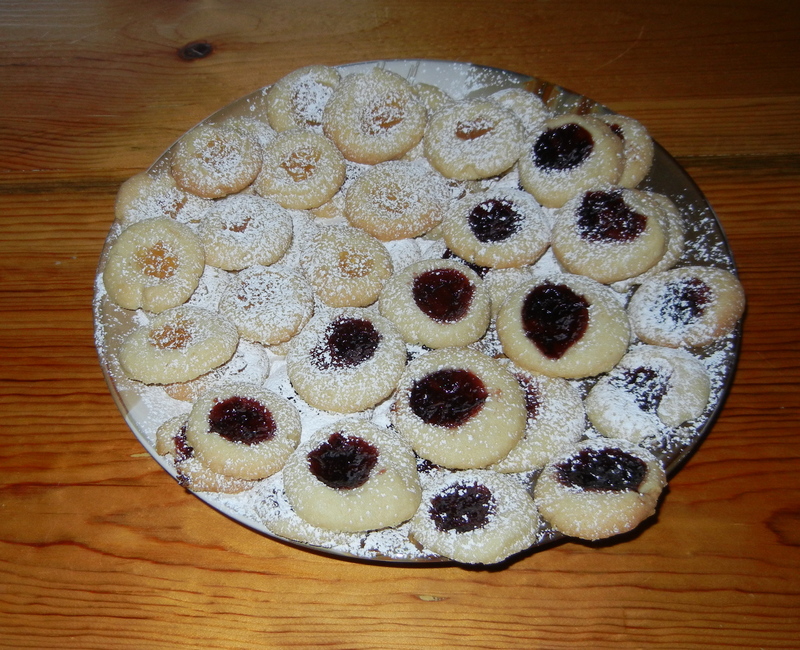 These cookies are a combination of recipes with some additions of my own. 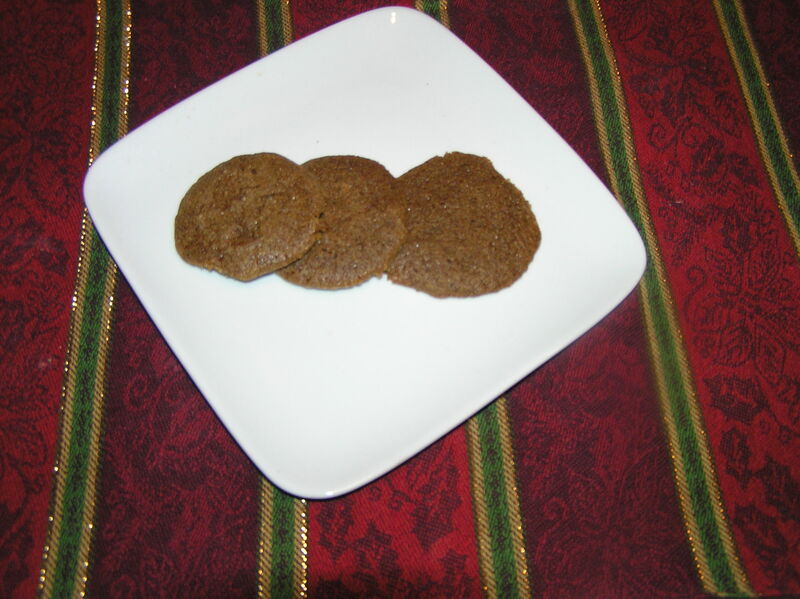 They taste very buttery, and the recipe makes at least 60 cookies, so despite the generous amount of butter, they are individually quite low in fat. They have lasted quite well out of the freezer (except for the ones I took to the office which disappeared immediately). I plan to freeze some for later snacking. Preheat oven to 350°. Coat cookie sheets with cooking spray. In a large bowl, cream together butter and sugar until light and fluffy. Beat in egg substitute and vanilla. Stir in zucchini. In a medium bowl, whisk together flour, baking powder, cinnamon, salt and oatmeal. Add to zucchini mixture. Beat until thoroughly mixed. Stir in raisins. Drop by tablespoonfuls onto prepared cookie sheets. Bake until lightly browned, 15 to 20 minutes, and transfer to a rack to cool. Repeat with remaining dough. Makes 60 cookies at about 3 grams of fat per cookie. 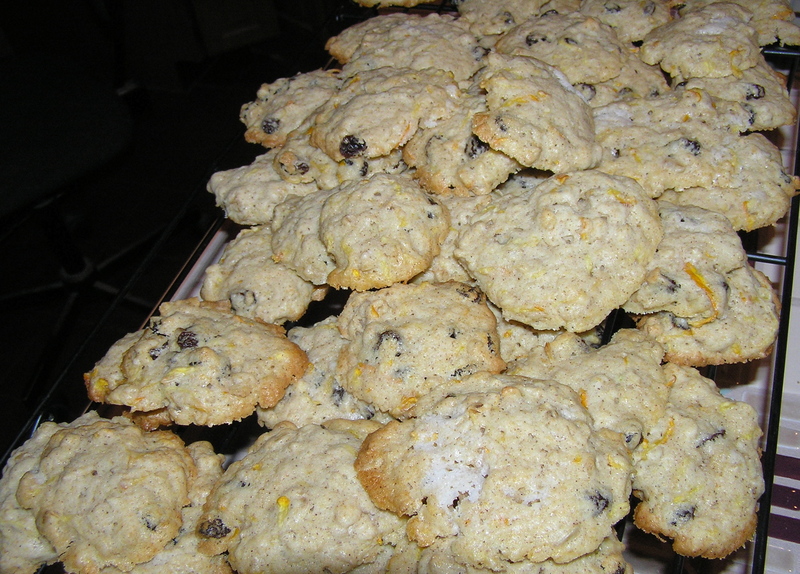 Note: I made this with yellow zucchini so there are flecks of yellow in the cookies. I don’t know how they would look with green flecks – although they would probably taste just as good. One of the joys of baking lots of cookies over the holiday season is that you have them in the freezer, waiting to accompany a cup of nice hot tea when you come home after struggling your way through freezing “wintery mix” falling from the sky. I baked 5 different kinds of cookies in the last few months, bringing them with me to various gatherings, and putting the rest in the freezer for later. When I was growing up, there were always homemade cookies in the freezer not only to snack on, but also to be able to serve something nice to guests who might drop by. These cookies came from Parade magazine. They were not exactly what I thought they would be. They are actually flat and somewhat soft – I kind of thought they would be thick and chewy. They are not really too spicy. But they are delicious, both fresh out of the oven and defrosted for an afternoon comfort snack. Whisk together the flour, soda, spices, and salt. In the bowl of an electric mixer, beat the butter, sugar, and molasses until well combined. Add the egg and beat one minute more. Blend in the flour mixture until you have a soft dough. Divide the dough in half and freeze for 30 minutes to firm up. Preheat oven to 350. Line one or two baking sheets with parchment paper. Put granulated sugar in a flat bowl or on waxed paper. Shape the dough by teaspoonfuls into balls. Roll the balls in sugar. Place the balls 2 inches apart on prepared baking sheet. Bake for 9-11 minutes, until the cookies are flattened and crackle-topped. Cool on pan for 10 minutes. Remove to a wire rack and cook completely. Makes 5 1/2 dozen cookies at 2 grams of fat/cookie. The latkes were not the only disaster for the Hannukah party. 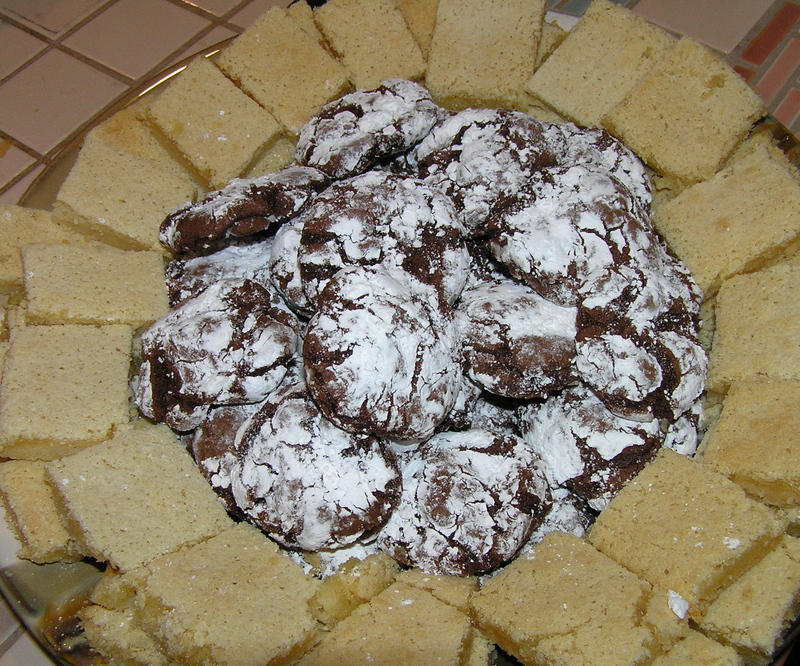 For the inevitable potluck, I planned to make a plate of cookies, including the famous lemon bars and an old recipe I found among my clippings called “Chocolate Crinkles”. Something, however, went terribly wrong. I should have realized something was amiss when the recipe said to stir the chocolate into the dry ingredients with a wooden spoon. Mine was way too stiff for that, and I needed to put it into my heavy-duty mixer. I should have realized there was a problem when the recipe said to put the dough into the refrigerator to chill for a couple of hours until it was stiff enough to roll into balls. Mine was already more than stiff enough. But I dutifully put it into the refrigerator to chill while I made the lemon bars. Then I took out the rock-hard dough, and realized that the recipe said to put the remaining cup of confectioners’ sugar into a bowl to coat the dough balls. What remaining confectioners’ sugar? I had mixed the entire 2 1/2 cups specified into the batter. You see, the recipe didn’t say 2 1/2 cups, divided, just 2 1/2 cups, and I was in my usual hurry and read the subsequent instructions quickly. But what was I to do. The potluck was in only a few hours, and I had run completely out of flour, eggs, and other baking ingredients. So I rolled the very stiff batter into balls, coated them with confectioners’ sugar, put them on the baking sheet – and baked. The worst that could happen, I reasoned, would be that I would only have lemon bars to take with me. Unbelievably, they chocolate cookies came out great. They were slightly crispy on the outside and chewy on the inside. They were very chocolaty. Everyone loved them. So I decided to provide the recipe as I made them. Preheat oven to 350 degrees. Spray one or two baking sheets with cooking spray. In the large bowl of a mixer, sift together flour, 2 1/2 cups confectioners’ sugar, cocoa powder, baking powder and salt. Set aside. In a medium-size heavy saucepan, combine chocolate and oil and warm over very low heat, stirring frequently, until just smooth. Be careful that chocolate does not burn. Remove from heat and let cool slightly. Stir in brown sugar, corn syrup, and vanilla until well-blended. Using a whisk, beat egg whites into the mixture until no lumps of brown sugar remain. Gently stir the chocolate mixture into the dry ingredients, beating on low until no lumps remain. Dough will be very stiff. Put the remaining 1 cup of confectioners’ sugar into a shallow bowl. Dusting your hands with additional confectioner’s sugar, roll portions of the dough into one inch balls. Dredge each ball in confectioners’ sugar until heavily coated. Arrange balls on baking sheets 1 inch apart. Bake for 8-10 minutes, or until the tops are almost firm when tapped. Let stand about 2 minutes until the cookies firm up slightly. Transfer cookies to a wire rack and cool completely. Store in an airtight container for up to 3 days’ freeze for longer storage. Makes about 5 dozen cookies with 2 grams of fat/cookie. Here they are nestled on a plate of lemon bars. They don’t even look like mistakes. These are lighter than air cookies that still have a bit of crunch to their outer shell. They are also reasonably chocolaty and very low in fat. These cookies are meringues, which are essentially egg whites and sugar, and so they are very easy to make. They say not to make meringues on a humid day, so do this when it’s not humid…I’ve never encountered this because I live in a rather dry climate. The original recipe came from Cooking Light, but I think a similar recipe exists in several other places, since I have been to potlucks where other people brought them and they say they are not from the same source. At any rate, they make a nice item to take to a potluck, or just for a snack. How often do you get chocolate in a very low fat format. Preheat oven to 300°. Cover two cookie sheets with parchment paper. I usually spray the baking sheet lightly with cooking spray to hold the parchment paper down – but don’t spray the parchment paper. Beat egg whites, cream of tartar, and salt at high speed in a mixer until soft peaks form. Add sugar, 1 tablespoon at a time, beating until stiff peaks form and all the sugar is incorporated. Sift cocoa over egg white mixture and fold it in thoroughly. Fold in minichips. Drop batter by level tablespoonfuls onto prepared baking sheets. Bake at 300° for 40 – 50 minutes or until crisp. Cool completely on pan on a wire rack.. Store in an airtight container. Makes 36 cookies with .4 grams of fat each. That’s right, less than a half of a gram of fat each! I snack a lot – in the office, in the car on the way home – basically, all the time. One of my principles is that a snack should be 4 grams of fat or less. Of course you can snack on lots of non-fat food like fruit. Grapes that have been cleaned and separated, for example, are good to eat when driving home. I’m not much on carrots and celery unless I have dip, although slices of red or orange pepper are tasty. I’ve gotten in the habit of carrying snack food with me at all times, lest I get ravenously hungry and stop for a bite to eat of some high fat goody. I often carry what I refer to as “food bars”, the chewy bars you buy in the grocery, since they pack in a purse or pocket well. There are some bars that meet the 4 gram requirement, but a lot of the tastiest bars are 8 grams or more, and since they’re not that filling, it seems like a waste of fat grams (and money) to eat them often. So I have been making my own food bars. These snack bars, which were called “breakfast bars” when the recipe appeared in American Profile, are rather moister than store bought bars. I packed them each separately in a zip top snack-size bag, and they kept and traveled well. I also froze about half of them. Preheat oven to 350F. Spray a 9 x 13 inch baking pan with cooking spray. Combine oatmeal and apple juice in a microwave safe bowl. Cover and heat on high for 2 minutes. Let stand for 10 minutes. Lightly spoon flour into measuring cups and level with a knife. In a large bowl, whisk together flour, wheat germ, 1/2 cup of the coconut, baking powder, baking soda, and salt. In a separate bowl, whisk together brown sugar, applesauce, carrots and eggs. Fold into flour mixture. Add oatmeal mixture and stir until just blended. 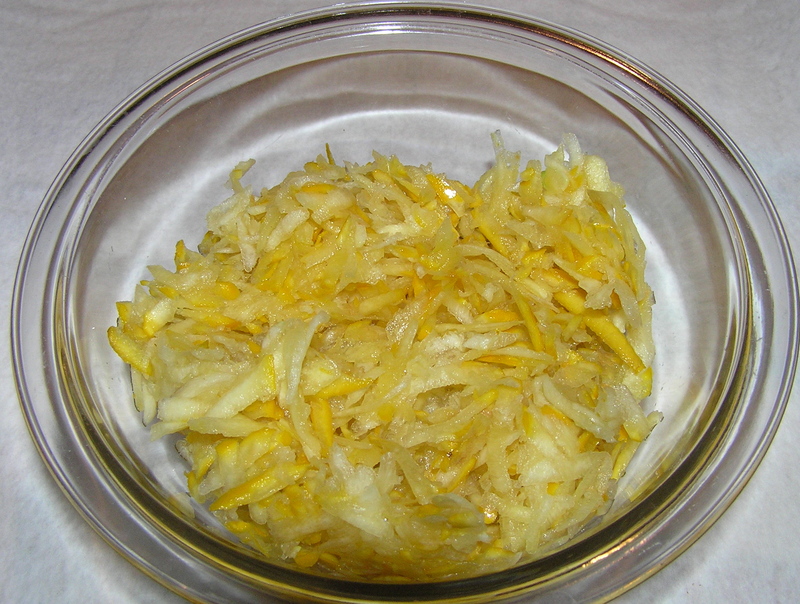 Spoon into baking dish and sprinkle with remaining ¼ cup of coconut. Bake 50-60 minutes or until a toothpick inserted into the center comes out clean. This makes 18 large bars at 2 grams of fat/bar. Note: These were good, but I wasn’t that crazy about the coconut, which I usually like. Somehow it didn’t go with the other flavors that well. I’m going to experiment with other nuts, and maybe raisins or dried cranberries. I’ll let you know how the experiments come out.